Ceiling block wallpaper sample printed with shades of maroon, red, pink, light blue, and gold on tan ground. Main section for ceiling corner: central motif consists of a incomplete circle form with sections and geometric designs in light blue, olive green, and other colors; from incomplete section of circle, extends a stylized lotus in golds and a bunch of roses in red and pink and smaller light blue flowers. Central circle bordered by geometric maroon border with stylized flowers. Surrounding the circle are three ovoid shapes filled with a small bunch of red and pink roses and green leaves. 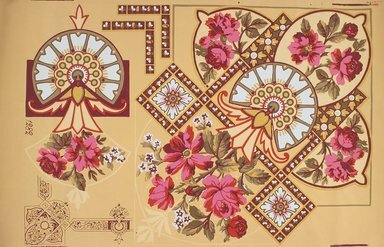 Printed at one end of the wallpaper is the border section in which the central circle motif repeats, but with smaller bunch of roses. Layout diagram printed in maroon appears in corner of sample. CONDITION: Good; few small tears along edges and narrow water (?) stains along one long end.